Family-owned and operated located in PA.
All Amish Structures has been providing high quality, Amish made, pre-built sheds and garages for over 50 years now. 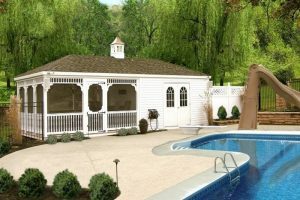 Our products include: Storage sheds, barns, garages, gazebos, pergolas and playhouses. We also build Amish furniture. With 2 large showrooms we have many sheds and other furniture on display. You can pretty much find anything you can imagine for your backyard and we are dedicated to offering a full-service solution to your needs. Our knowledgeable sales staff and installers coordinate and manage every detail of your project from beginning to end. Count on our personnel to provide professional site preparation, layout, excavation, laser leveling, and installation of our sheds and garages. At All Amish Structures, along with our pre-built buildings we also offer an array of other furniture. We have building solutions in a fantastic range of styles and sizes. You can select something that will perfectly meet your taste. All Amish Structures is not just a dealer with no workforce. We are a full service company. During our early years, we invested in quality equipment and skilled personnel to ensure total customer satisfaction, before, during, and after the sale of our Amish sheds and garages. We do service the products we sell as well. With our specially designed trailers and other unique delivery equipment we can deliver your custom Amish shed or garage safely, efficiently, and directly to your home or business. This ensures damage-free results, each and every time. Having a custom Amish shed or garage will help you free up living space, you will also be able to clear room in your garage. Garages can be a good place to store things, specially yard, equipment, but eventually it is easy to get carried away and let your stuff take over the entire garage. This leaves little or no space to park your car. Being able to park your car in the garage allows you to use the garage for its real purpose and to protect your car. Keep your home clean by using a custom Amish shed or garage. Often, items that go into your shed are things you use in the yard, or bulky items that may collect dirt, grass and other debris over time like shovels, watering cans, or lawn mowers. Even if items are damp or wet you can store them without having to be concerned about wiping down the floors or cleaning. Interested in custom Amish sheds or garages? All Amish Structures we can provide you with any custom shed or garage to meet your needs. Our buildings are ideal for storage from garden tractors and lawn mowers, to motorcycles, bikes, snowmobiles, and even cars. Copyright ©2019 All Amish Structures. All rights reserved.